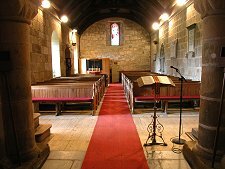 Birnie Kirk is one of the oldest church buildings in continuous use in Scotland. It lies on very minor roads some three miles south of Elgin, and a few hundred yards to the east of the River Lossie. Birnie Kirk was built in the years around 1140. But if the kirk itself is ancient, the site on which it stands is still more so. The more or less circular kirkyard is raised above the surrounding landscape and walled, and was originally occupied by an earlier Celtic church dedicated to St Brendan the Navigator, an Irish Saint. The title Navigator was bestowed on St Brendan following a voyage of discovery he undertook via Iceland to what was called at the time St Brendan's Isle: very probably Newfoundland. 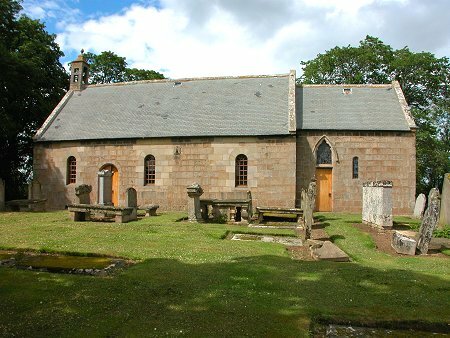 In its early life, Birnie Kirk served as the first cathedral of the Bishops of Moray, a role it retained through the tenure of four Bishops. 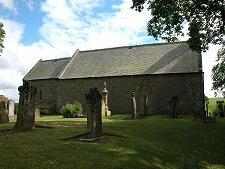 The kirkyard at Birnie is believed to be the last resting place of Simon do Tonci, the 4th Bishop of Moray who died in 1184. This role as cathedral probably helps explain why the kirk, though small and plain, was exceptionally well built. In the 1200s, the title of cathedral was moved to a church on the site later occupied by Elgin Cathedral whose ruins still stand today. In 1734 the church was altered (and shortened by two feet) when the west gable needed rebuilding. During this process the windows in the south side of the nave were enlarged. Further repairs were undertaken in 1891. 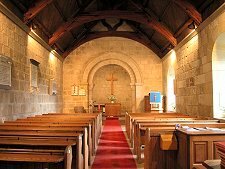 Internally, Birnie Kirk has a beautifully tranquil feel and you know without doubt that this is a building of great age. 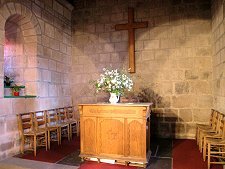 The architectural highlight is the Norman arch between the nave and the chancel. 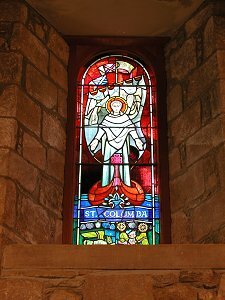 There are also a number of highly attractive stained glass windows on view, most notably one in the west gable dedicated to St Columba. Birnie Kirk is home to some remarkable relics. The square Coronach Bell is thought to be over 1,000 years old and could well have come from the church Birnie Kirk replaced on this site. The bell is said to have been blessed by the Pope, though the stories are vague about exactly which Pope. The kirk is also home to a Hairy Bible, dated 1773. The description comes from its binding, of calfskin with the hair still attached. Externally, the raised site provides excellent views of the immediately surrounding countryside. A stone near the war memorial in the kirkyard is Pictish in origin and carries the carving of an eagle, a notched rectangle and a Z-rod. The stone gives a nice sense of continuity to the site by providing a direct link to the Pictish builders of the first church built here.